As Chief Commercial Officer, Sai has global responsibility for ensuring the long-term commercial success of ThoughtWorks. His focus is on executing strategies for greater client value and enhancing our competitive differentiation, identifying and supporting growth engines, enterprise transformation towards strategic demand creation and strategic client management. 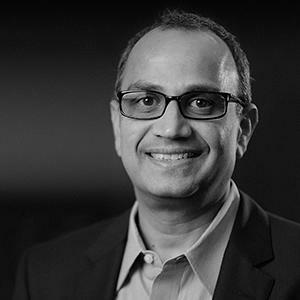 Sai joined ThoughtWorks in 2010 as the Global Head of Demand. Recognized for his ability to grow client relationships and stewardship of identifying and building growth accelerators, he was promoted to Chief Strategy Officer in 2013. For more than 25 years, Sai has built a strong reputation among clients and colleagues around the world for his ability to build global technology businesses. His expertise crosses many dimensions including developing strategy, driving organizational change, delivering technology solutions, and mentoring leadership talent. Prior leadership roles include Global Head of Financial Services and Global Head of Travel & Transportation at Satyam Computer Services (now Tech Mahindra), a $4 billion IT services firm. As a member of the executive leadership team there, Sai managed end-to-end P&Ls, led global sales, product, marketing and development teams, and major strategy and transformation efforts. Sai earned his MBA from the Indian Institute of Management and Bachelors degree in Mechanical Engineering from VNIT, India. He currently lives in Chicago with his wife and is preparing to send his second son off to college.